This is the Urchin Tracking Module (UTM) parameters. It contains five variants of URL parameters used by marketers to track the effectiveness of online marketing campaigns across traffic sources and publishing media. The purpose of UTM is to track the performance of certain campaigns that links to your website easily. It’s mainly to see the performance of your referral site that’ve your website links in it. 2. Copy the generated link and place it in the other sites that you wish to. 3. To test if the tracking is working, you can test it by clicking it 1st or run it directly in your browser. 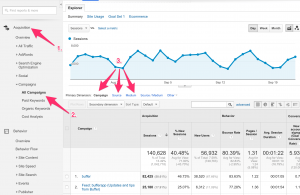 Open your Google Analytics account check if the parameters (utm_source, utm_medium, etc) appear in your campaign tab.